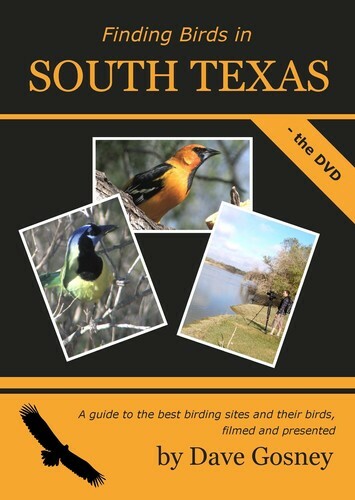 This DVD covers the best birding sites in the Lower Rio Grande Valley, described by Kenn Kaufman as the best birding area in the USA and gives you a real ‘feel’ for what it’s like to go there. The best sites - covers the best birding sites in the Lower Rio Grande Valley. The best birds - featuring no less than 120 species including many of the Rio Grande specialities such as Green and Ringed Kingfishers, Audubon's and Altamira Orioles, Pauraque and Clay-colored Robin and all filmed using high-definition digital video cameras. The best information - find out more about the sites and their birds, including what to listen for, to help you find more species. This film shows exactly what it’s like to visit South Texas. You’ll see footage of the most exciting species, you’ll get an idea of what each of the sites is like and you’ll learn more about the area and its birds.